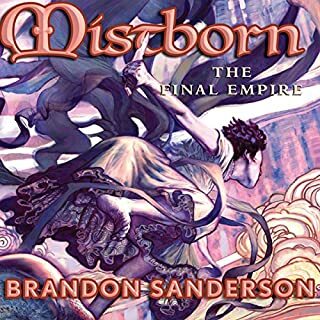 After bursting onto the fantasy scene with his acclaimed debut novel, Elantris, and following up with his blockbuster Mistborn trilogy, Brandon Sanderson proves again that he is today's leading master of what Tolkien called "secondary creation", the invention of whole worlds, complete with magics and myths all their own. Warbreaker is the story of two sisters who happen to be princesses, the God King one of them has to marry, the lesser god who doesn't like his job, and the immortal who's still trying to undo the mistakes he made hundreds of years ago. Their world is one in which those who die in glory return as gods to live confined to a pantheon in Hallandren's capital city and where a power known as BioChromatic magic is based on an essence known as breath that can be collected only one unit at a time from individual people. By using breath and drawing upon the color in everyday objects, all manner of miracles and mischief can be accomplished. It will take considerable quantities of each to resolve all the challenges facing Vivenna and Siri, princesses of Idris; Susebron, the God King; Lightsong, reluctant god of bravery; and mysterious Vasher, the Warbreaker. 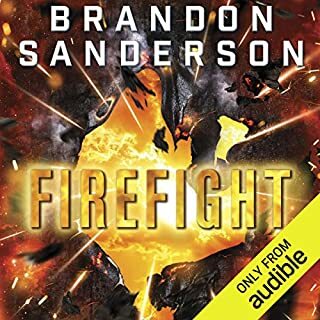 Great story, as expected from Sanderson, but not his best. It's still a must read! It's rare, but I can say I did not see most of the twists and turns coming in the book. Th beginning is very predictable the rest is not. another spectacular sanderson story. extremelt entertaining and engaging. its epic fantasy in its purest form. I really liked it. found the story line unique in terms of the magic system Sanderson came up with . plus the audio book is very well read. mostly dialogue... cloudy plodding plot with an incredibly disappointing ending. final 2 chapters ended abruptly, in an anticlimactic, predictable, and patronizing way. not worth the money. Interesting magic system, though it took a while to be sufficiently explained. 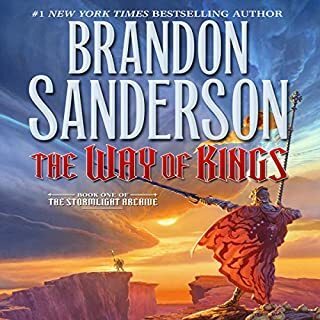 I truly like Sanderson's voice and world-building. The climatic pay-off was a little less satisfying only because many scenes and situations in the book seemed like they would lead somewhere and didn't. I was left feeling like this book could have be shorter than it was. 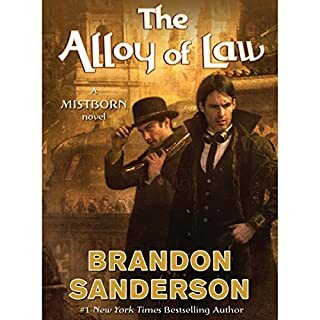 It is by no means "bloated" because, unlike many fantasy authors trying to be epic, Sanderson's voice and prose are engaging and mostly relevant to the here and now. The scenes and situations always intrigued, but as mentioned didn't always pay-off. This is my second Sanderson novel. 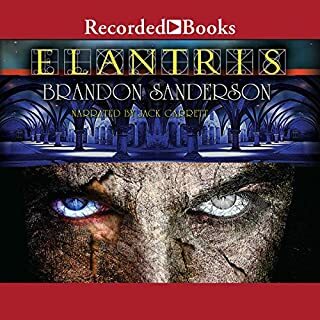 I liked Elantris better. But what I appreciate about both of them is that they are both one-offs. In cases like these I trust the world-building to be relevant to the story and not about setting up sequels and prequels. I think I am now ready to try one of his multi-part epics to see if he can keep me as engaged as he has in the on-offs. Mr. Sanderson proves once again that his imagination is limitless. 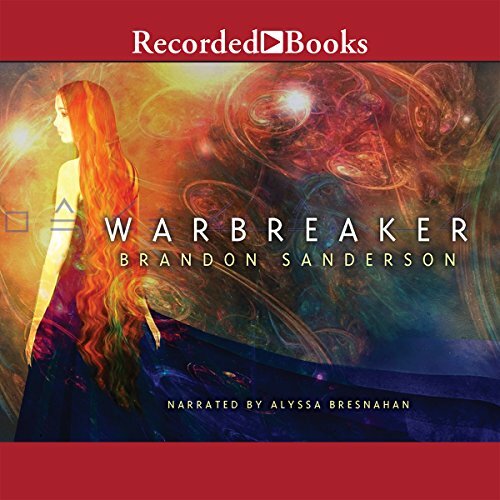 Warbreaker takes you on a journey of self discovery, betrayal and a mighty twist at the end. A must read. low quality book was broken/out of order chapter. tried downloading it multiple times. hq download worked much better. First of all, I'd like to thank whoever arranged to re-record this book with Alyssa Bresnahan as narrator. The book's description always intrigued me, but I didn't like the original narrator (at least based on the sample I heard), so didn't purchase it--until the re-record. I'm glad I waited. Bresnahan is terrific. 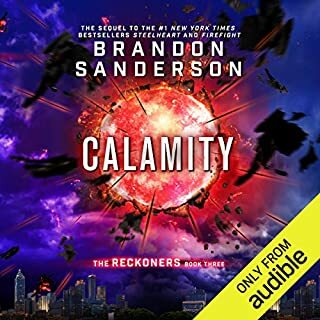 Brandon Sanderson is also terrific. My introduction to his work was “Way of Kings,” which is kind of jumping in the deep end. 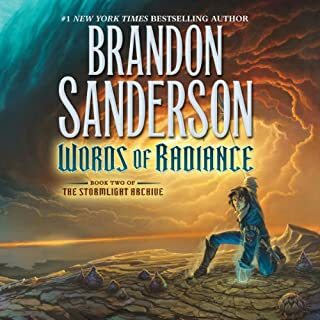 I had to read it twice but I loved it and its sequel “Words of Radiance” (with, apparently, much more to come). 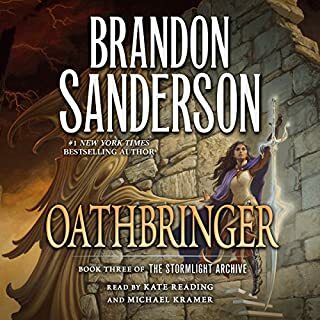 “Warbreaker” is part of the same fantasy world as “Kings” and “Mistborn”—what Sanderson (and his fans) call the Cosmere--but it is a standalone. It is also more of a romance than “Kings” and more upbeat than the Mistborn trilogy. But this doesn't mean it's a romance novel, or that it doesn't have a lot of violent and hard-edged moments. 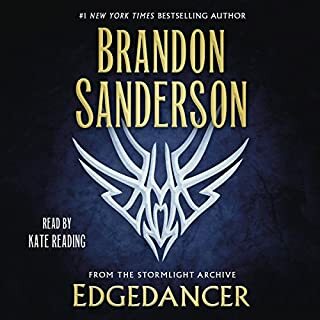 I just thoroughly enjoyed the book from start to finish, especially the character of Lightsong. It's funny, action-packed, sad, thought-provoking, and unpredictable. The ending is satisfying if bittersweet. It leaves the way open for a return of some of the characters, but also provides closure so we don't necessarily need them to return. 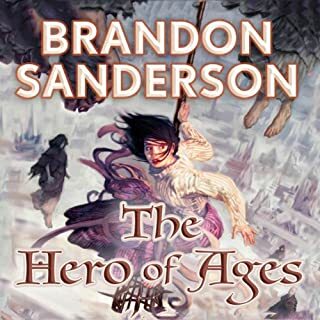 Man, Brandon Sanderson is the MAN in the high fantasy genre right now. He is just heads and shoulders above everyone else currently writing in his field. I have loved every single book that I have read of his. Warbreaker is no different. My only complaint is that it is not a series! I would LOVE to hear more from this world. I think the stories and characters would lend themselves to many more books! Come on, Brandon! Keep this world alive! This story centers around a young woman who has been given to another "country" as a bride to their God King. It follows her and her adventures as she tries to become what is expected. There are multiple story lines interwoven, and every character is so fascinating! Not to mention expertly written and consistent throughout. Sanderson's real gift is in the worlds that he creates. He is capable of such amazing imagination and originality. There are no other ideas like his, and he has so many differing ones that I just can't believe that one person is responsible for all of them! He is such a master. The narrator, Alyssa Bresnahan, also does a spectacular job! I am usually partial to male narrators in the fantasy genre, but Alyssa is truly fantastic. Excellent book! Incredibly thankful that this book was re-recorded. I held off on purchasing it before because I could not stand the reader. That being said, Bresnahan does an amazing job bringing the characters to life. Sanderson does not disappoint. Epic, yet human and absolutely entertaining. "Warbreaker" was an absolute pleasure to listen to. 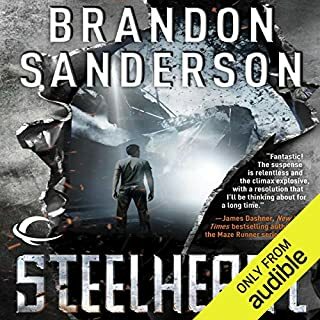 By that, I not only mean that the narrator Alyssa Bresnahan did a terrific job, but the writing, storyline, and descriptive feel of it all was easy to invest your imagination into. The little sparks of detail made all the difference here. From the way the characters dress to the way magic influences belief systems within the setting, a listener will be awed by the imagery the details paint within their minds. 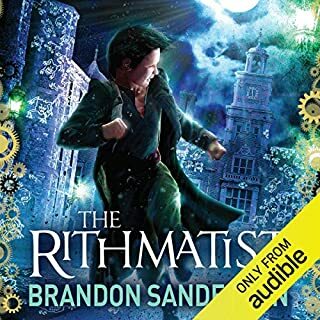 The characters felt so rounded and relatable that about ten hours into this audiobook a person might relieze that there have only been about ten minutes of action of any sort...and be surprised that they don't miss the lack of it at all. There are four main perspectives that the listener views the story from. These perspectives are from two sisters; princesses that are polar opposites in personalities but find themselves thrown into dangerous political challenges neither are really mentally prepared for, a god who can't remember who he was yet can't seem to shake his moral compass no matter how hard he tries, and a mysterious man and his sarcastic magical sword. Their stories weave together to create a tapestry of events that slowly reveal truths and hidden threats in a natural and intreguing way. 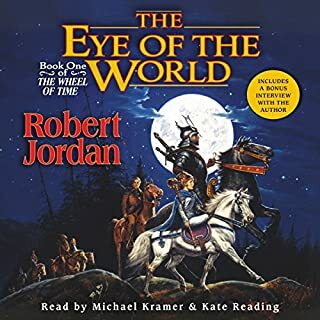 This audiobook is highly recommended to audiobook listeners who enjoy a fantasy setting that makes them think and reflect. This book is art, politics, mystery, adventure, and drama all rolled into one engaging story. It's still better than most junk out there. On a crusade to read everything from my favorite author, I'm underwhelmed. So far I think this is his weakest Cosmere Novel. Now don't get me wrong, it's still a great story, but it didn't really click with me. 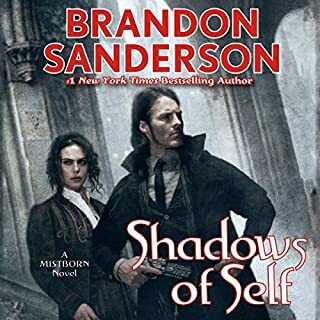 It has all the classic Sanderson quirks, specifically the good guys are generally broken anti-heros, the magic system is well thought out, and different. Hoid has a larger part.That being said, it's not the book I'd use to introduce people to Sanderson. What about Alyssa Bresnahan’s performance did you like? She's up there with Victor Bevine, Kate reading and Michael Kramer. I think I could enjoy her read math text books. The problem was in the characters, they seemed to obvious and over stereotyped. A god that doesn't want to be a god, a bumbling princess, a ex bad guy atoning, and a clueless ruler. The ending seemed very rushed. and the climax felt stunted. It's still a lovely story, and the journey was a good one. I'll be enjoyed again. 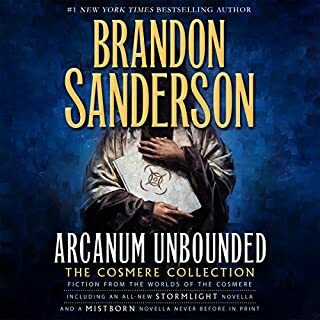 As with all of Bandon Sanderson's stories, the characters are believable, relatable, and compelling. The only downside is that this is a stand alone (at the moment) novel. I for one would love to see a prequel or sequel to this story. Along side a great story, he narration by Alyssa Bresnahan was superbly done. I was well pulled in. 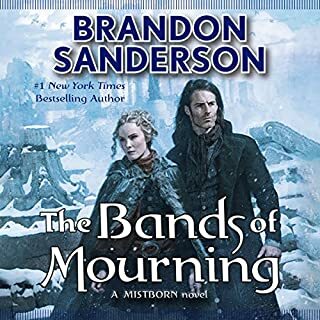 Took a little while to get going and some of the characters are a little melodramatic, but Sanderson always has a few characters to love. I loved the sword. The more you read, the more you want to read. 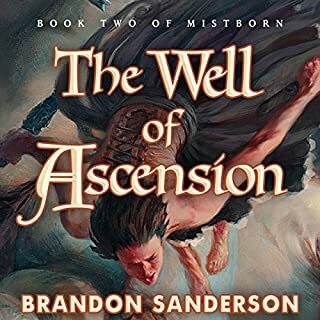 Enjoyed the twists and turns another great book by Brandon Sanderson. Held my attention and was cleaver right to the end. Hope this is just the first book in a new series. Strong women lead characters well developed with a story full of Sanderson usual captivating, clever and imaginative inventions/powers. that it was imaginative and cleaver enough so it held surprises right until the end. Which character – as performed by Alyssa Bresnahan – was your favorite? You know how when you read the 2nd or 3rd book in a series they often (fairly awkwardly) reiterate things that you obviously already know if you've read the first book? For some reason this book does this repeatedly in the same book. Really basic concepts get repeated over and over again. If you're looking for a book to half listen to while you're doing other things then maybe this is a good fit. I personally felt the pace really drug and the repetition was obnoxious. I wasn't a fan of the narration either. She is certainly a competent voice actor but I often felt the inflections and attitude she gave the voices didn't match the characters and dialogue very well. 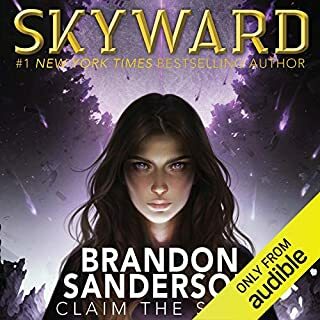 Great narration by Bresnahan giving life to all the characters as she presents another fully formed world of magic in Sanderson's fantasy universe. The level of detail is unparalleled and the story will keep you on the edge of your seat. 25 hours of top drawer entertainment for one credit. You can't go wrong with this one.